We are often asked about our free wood chip delivery service. In this two-part blog post series, we’d like to answer some of the most common questions we receive. To start off, this post will take a look at why wood chips are important and how they should be used. Why are wood chips from a local arborist better than processed chips? 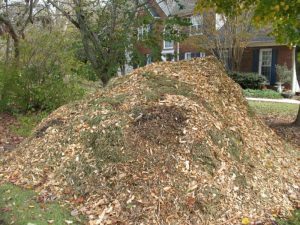 You could pay a green waste company for a delivery of processed chips for $25 – $60 per cubic yard. Instead, you could contact a local arborist, like Traverso Tree Service, and get a load of fresh chips delivered free of charge. While they might not look quite as uniform as processed chips, fresh chips provide the same benefit to your landscape and the carbon footprint is much lower. Processing wood chips involves miles of transportation, use of massive machines, and the application of artificial paints. There is no doubt that getting chips from a local arborist is the greener option. Why are wood chips important? 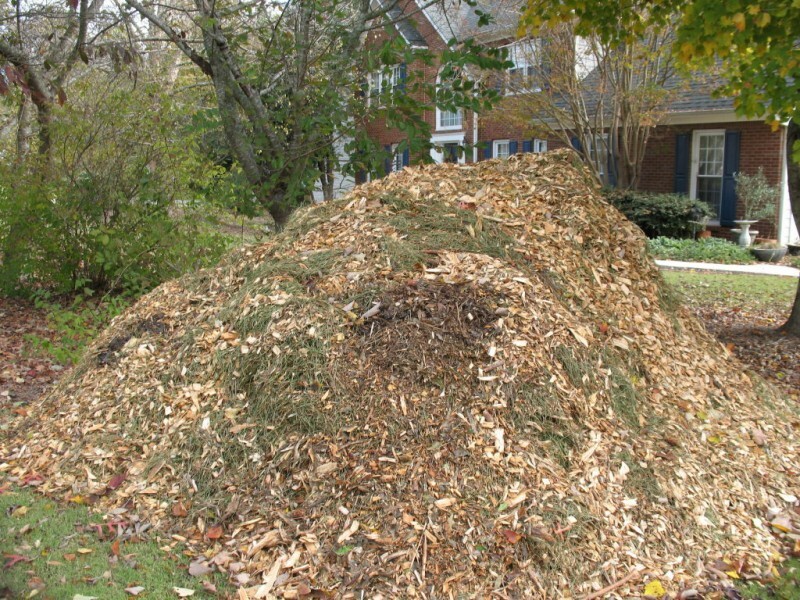 Wood chips are a valuable part of any healthy urban or suburban landscape for a few reasons. The most obvious impact of wood chips (and other mulches) is that they improve the appearance of a landscape. However, their benefits don’t stop there. Wood chips are also beneficial to landscape plants and trees because they help conserve soil moisture, reduce invasion of weeds, decrease soil temperature fluctuations, and increase soil fertility. Source: Chalker-Scott, Linda. “Using Arborist Wood Chips As Landscape Mulch.” Washington State University Puyallup Research and Extension Center, January 2015. How should I apply wood chips? In order to receive the maximum benefit from wood chips, they must be applied correctly. The best practice is to lay down wood chips before annual weeds are established, usually in the spring and fall. Mulching is most effective at suppressing weeds before their seeds germinate, preferably on bare soil. If this timing isn’t possible, then mow the weeds close to the ground and mulch immediately. When applying chips, studies have shown that spreading them at a depth of 3 to 6 inches is optimal for weed control and soil health. Never let the mulch touch plants, and definitely don’t pile it up into a “mulch volcano” around the trunk of a tree or shrub. 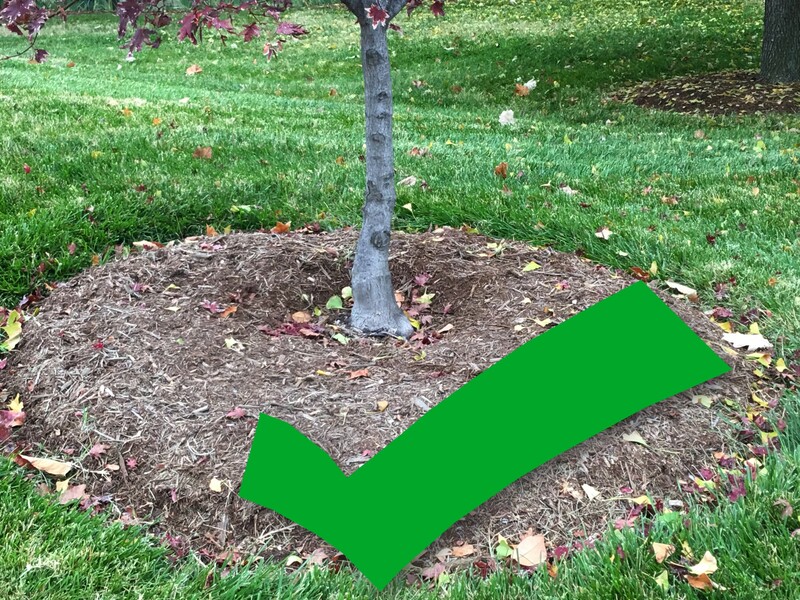 Mulch creates a dark, moist, low-oxygen environment that is excellent for the growth of disease organisms, such as canker-causing and fungal plant pathogens. This environment also attracts insect pests. It is best not to use wood chips in raised beds or vegetable gardens because this can lead to fungal infections on these sensitive herbaceous plants. 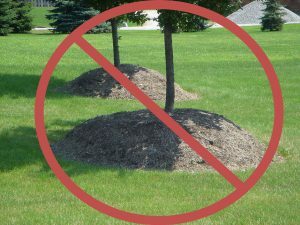 Also, keep mulch away from building foundations because it can act as a bridge that allows pests to enter houses and garages. It is best to maintain a narrow strip of bare soil along the edges of buildings to avoid infestations. Picture 2 & 3. A mulch volcano shown on the left. Very bad practice. Properly applied mulch shown on the right. Are wood chips a fire hazard? Coarse textured mulches, like wood chips, are the least flammable of organic mulches. Fine textured mulches, cardboard, and rubber mulch are much more likely to catch flame. Precautions should still always be taken. For example, if you are using flamers for weed control, be sure to soak the mulched area first. Also, when spread into an appropriate thickness, there is no reason to worry about spontaneous combustion. If a large pile is allowed to sit for long periods during the hottest summer months, risks increase, but only marginally considering the size of the piles you’ll have delivered.